In a cocktail shaker muddle 5 raspberries, berry syrup & ‘POM’ juice together. Fill with ice. 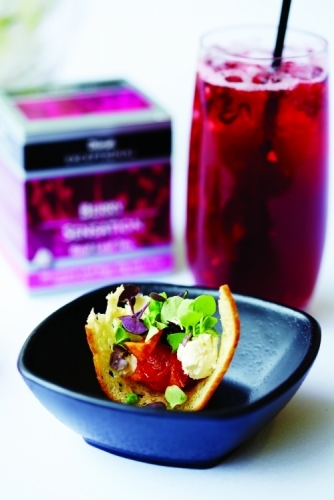 Add 90ml brewed Dilmah Berry Sensation tea (room temperature) and add a squeeze of lime. Shake until all ingredients are combined and pour into a tall glass. Top with ginger beer and garnish with pomegranate kernels. On a mild heat, combine one cup of brewed Dilmah Berry Sensation tea with sugar and berries. Reduce until syrup is formed. Drain berries before serving.